'Borstal' is the British term for reformatory where young offenders were sent for training and rehabilitation, the first institution was established in 1902 at Borstal Prison in Kent, England. 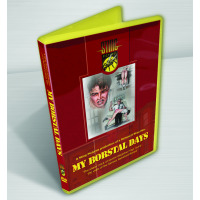 'Borstal' is the British term for reformatory where young offenders were sent for training and rehabilitation, the first institution was established in 1902 at Borstal Prison in Kent, England. Borstals in Britain were graded to cater for all categories of delinquent lads. Some establishments were secure and closed while others were open with no walls. All shared one thing in common, they daily routine was strict and discipline always severe. After a warehouse break in Charlie Fox and Phillip Stevens are sentenced to eighteen strokes of the birch and two years training at Rainsford Borstal. The swish and crack of the cane, the ringing smacks of a good old fashioned spanking plus the hard use of the birch and tawse echo round the high walls of this famous institution. Charlie and Phil along with all the other trainees come face to face with the severest discipline that the system could hand out. Many of these re-enactments in this film are based on fact and in the eighty years of Borstal history would have at some point in time taken place.